One of the hallmarks and defining characteristics of Unitarian Universalism is that we have no creed. This does not mean that we do not have beliefs; nor does it mean, as is sometimes said, that “we can believe anything we want.” In our non-creedal religious movement, we have individual beliefs, not collective beliefs. As Unitarian Universalists, we formulate our belief statements in terms of credo, which is the first person singular (“I believe”); not creed, which is a doctrinal set of beliefs (“we believe”). It’s not that we can believe anything we want to, it’s that we can—and do—believe what we believe. We believe what we have to believe, not because anyone else or any written text tell us we “have to believe,” but because “…our senses, our learning, our Earth, our communities, and our wise people” (as Unitarian Universalist minister Barbara Wells lists some of the sources of wisdom from which we draw) give us reason to believe. Our own stories are among our sacred texts. We are responsible for developing our own beliefs in light of our own experience and conscience. A participant in an introductory session on Unitarian Universalism asked me whether this means that we are “required” to develop our own beliefs, and I found this an intriguing question. 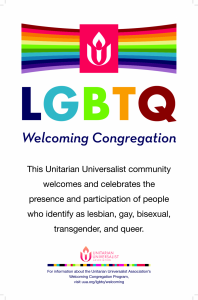 For Unitarian Universalists, there is very little that is required by external authority! Yet my hope is that each of us does feel ourselves “required” to develop our beliefs; that we will feel called to do so, to enrich our own spiritual lives and our conversation in community. No one else will do it for us! It matters what we believe; it matters even more how we live our beliefs. One way we engage in articulating our beliefs is through workshops designed to help participants figure out what they believe about some theological questions (such as the meaning of life and death; the nature of human beings and our place in the universe). I’ll be offering a Credo Workshop in October and November, and the schedule will be available soon.